Now that the majority of the baby knitting is caught up, I returned to the Must-Have Cardigan. 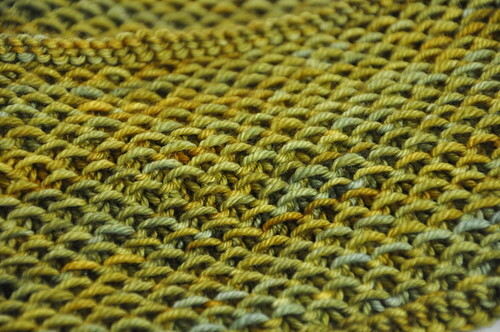 I was happy to discover that what had felt like a black hole of cables and increases was left at a great stopping place and there were only 40 rows and binding off remaining. 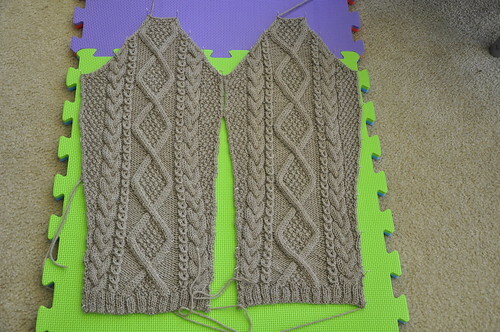 I worry that this sweater needs precise length on the sleeves, so they won’t have to be rolled up. 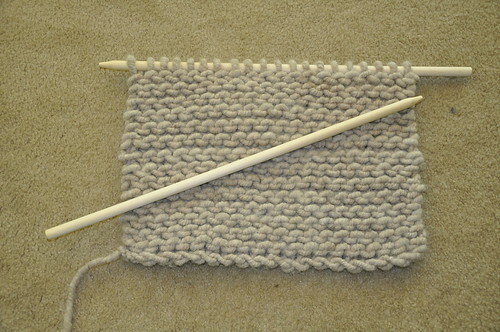 I didn’t knit the entire recommended length, but we’ll have to wait and see if it works. Leftover from a photo shoot, I am a very fortunate recipient of alpaca fiber. Three examples were provided. The first is a super super bulky with some extra twist. My swatch used up the entire 55 yards. If I can figure out a good backing and filling, it will used as a throw pillow. The other two alpaca examples including roving and nearly 8 oz of locks. I’m hoping to spin the roving, even with my limited experience, into enough for a hat. I don’t have any carders, so I’ll have to consider the possibilities for processing the rest. Honey cowl the first, a little too small, was cast on with 160 stitches. Honey cowl the second, a little too long, was cast on with 200 stitches. This one was cast on with 180 stitches. And the MadelineTosh in Filigree is beautiful. It’s 90 degrees outside, but I may need to wear it anyway. Edited to add photo with alternate lighting. 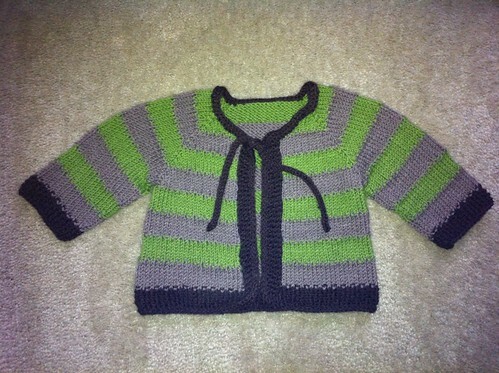 This sweater is the last in the series for a friend’s baby. Bootees, hat with ears, crocheted blanket, and, finally, Tulips. Brown and green match the chosen theme colors. I made the 12-month size, hoping for a good fit this winter. 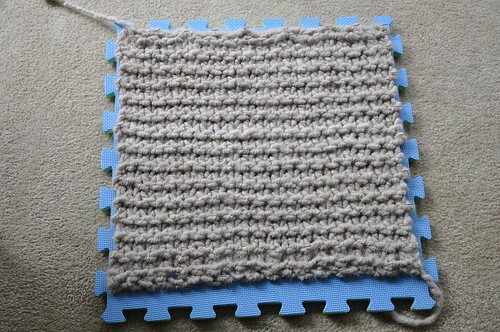 The yarn is 75% acrylic/25% wool, so it took some direction during blocking and should be fine in the washer/dryer. I hope they both enjoy it! While at the store to pick out baby sweater yarn, I was mesmerized by some MadelineTosh DK in Filigree. An intriguing combination of mostly yellow-green, with teal and golden accents. I left it on the shelf that day, knowing that I was knitting on a deadline and it would be hard to resist. 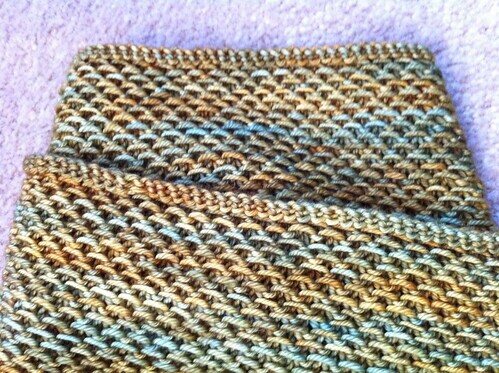 But, now, it’s on the needles for… honey cowl number three!